We’ve recently replaced our raggedy ol’ make-shift clothesline for a nicer, sturdier one, and let me tell you, I am one happy homemaker over here. When we first moved into this house I took a trip to Home Depot to get the supplies to make my own “clothesline” from something I saw on Pinterest. I got thick rope, a few S hooks, and some twist in hooks and went home to rig up a little line to dry what would amount to about a half of a load of laundry. It did the job for our bed linens and clothing I didn’t want to risk shrinking, but after a few months of wear and tear I rethought the whole clothesline thing and wish we would have just gotten the real deal from the start. Andrew and I knew we would be taking on yard projects in the coming years so we added it to our wish list and made do with the one I had strung up from a tree in the corner of our yard to the fence door. After all, we had been line drying our clothing on our bistro lights when we lived in our tiny condo by the park and that worked fairly well for us. Why clotheslines? Well, my mother had a clothesline, and her mother too, and I grew up watching our shirts and pants and pillowcases dance in the wind as they dried. The simple task of hanging clothes has special meaning to me and has come to symbolize something much more than a means of cost-effectively drying our clothing and bedding. It represents the thoughtful intention and care the women in my life have lovingly put into chores and tasks of the home. Beautifying domestic pleasures, such as doing the dishes, making beds or drying laundry, is one way you can add more joy to the rhythm of your day. As a family of five we have a lot of dirty clothes and this chore is something I tend to daily. Why not make it beautiful and meaningful? Here is what you’ll need to make a clothesline, some reasons for doing so and a few helpful tips for those who choose to go this route. A clothesline, of course. We ordered ours from the Vermont Clothesline Co. and Andrew installed it one Saturday afternoon a few weeks ago. It is of most excellent quality and is as sturdy as we had hoped it would be. Clothespins. I get mine from the dollar store and use them for everything from chip bag clips to cord holders. I have been wanting to try out the old-fashioned kind but the cheap ones I bought in bulk for a dollar are pretty good for now. A basket for housing clothespins. The little woven basket pictured is from our local Hobby Lobby. I picked it up a few years ago when I was on the hunt for the perfect shade of cream yarn and it has been in our bathroom housing hair pins ever since. It hangs well on our new clothesline and is the perfect size, so as of this spring it has a new home! I keep this basket on our peg rails in the hallway near the back door so it’s easy to grab on my way out. Cement, depending on the quality of your soil or the depth of your dig. You may want to consider cementing the posts into the ground before covering them with mud. We opted to do this to ensure a sturdier structure. Freshness: I think line dried linens and lilacs are my top two favorite smells, and wouldn’t you know, both were big parts of my childhood. When the towering lilac bush on the side of our house would bloom in the spring and early summer, I would head outside to clip big bunches of it to display on the window sill or by my bedside. That distinct smell reminds me of growing up in Iowa and all the adventures I went on as a child. And then there’s my other favorite smell, that of line-dried laundry. I have never found a smell that quite matches the freshness of linens dried by the fresh outdoor air. I remember going to bed when I was little, eager to pull back the tightly tucked covers and sheets so I could climb into bed and press my nose into the freshness of my clean, cool sheets. If my mom had dried our linens on the line that day, I would walk through them and bring them to my face to inhale their scent. I remembering running my hands along the seams of pillowcases and trims of dresses to see if they were ready to come inside. My mom had a retractable line that my dad put in for her on mother’s day and my grandmother a wood one on their property in the country. My grandma’s was really long and could hold about five to seven loads of laundry. It was strung on the side of their house on the farm, a country staple I love seeing from the road when Andrew and I take trips back home. To this day, the smell of laundry that has been blowing all day in the breeze brings back a flood of happy memories and helps me sleep like a baby. Economy: This reason is the practical one of the bunch, but it wouldn’t be appropriate to talk about the reasons one should use a clothesline without the mentioning of saving money. 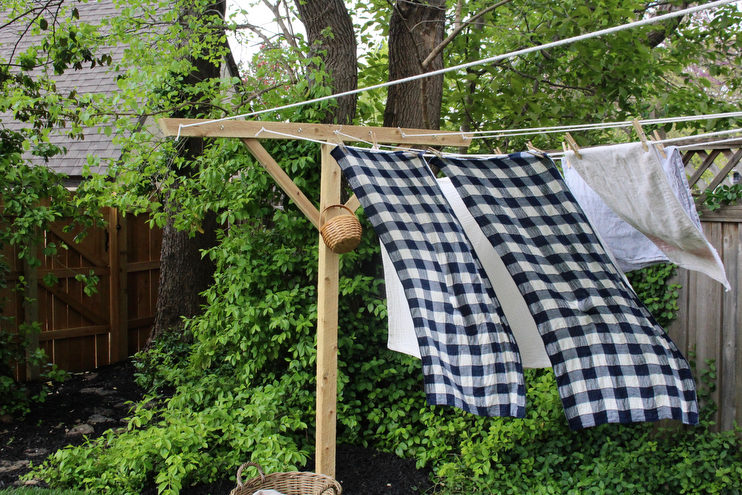 Taking your clothes outdoors to dry can make a considerable difference on your electricity bill if you are doing daily laundry and even help when it comes to budgeting. Even if you choose to only line dry a portion of your laundry, you are still making an impact and saving money you could be putting elsewhere while reducing your carbon footprint. Intention: As a homemaker and stay at home mom I am all about practicing mindfulness and taking extra steps to weave together beauty and practicality as I go about doing chores around our home. For example, by being intentional when it comes to line-drying laundry I am more aware of what I’m throwing into the laundry basket. If something is not entirely dirty per se, what’s the point in going through all the steps of trekking it down to the basement, sorting it, washing it, drying it, folding it and putting it away if it’s not really that dirty? Unless it’s one of Alfie’s blow outs or muddy overalls or whatever, most things can be re-worn a few times. Until a few months ago I had gotten myself into the habit of chucking everything (even clean clothes for crying out loud!) into the laundry bin just because I didn’t want to bend over and pick it up and put it away. Tell me I am not alone in this one. Now that spring is here and we have a proper clothesline, I feel as though I pay much more attention to what we wash and dry because it does happen take a little bit more time to complete the laundry process for five people when we line dry, especially since three of them are little people who make big messes. And another nod to intentional homemaking: I find it to be really nice when you can chose the unexpected route of doing something by hand rather than leaning on technology or a machine to carry the load (pun intended). I do love technology, but I also have an appreciation for things done the ways our mother’s did them simply because it makes me happy and most often is of better quality. Nature Wins: Did you know dryer sheets are just about the most toxic thing you can bring into your home? Well that and bleach! I urge you to toss those if you have them on hand. Our family is in favor of more natural earth-friendly options when it comes to housekeeping and I truly feel we are better for it. Less chemical based products, like bleach and drier sheets, help keep our clothes toxin free and leaves less of a chance for little ones to get into something harmful. And you know what, I have found that the sun actually works better than bleach. If I’ve got a major stain on my hands I’ll scrub with a fels naptha laundry bar and leave it in the sunshine for a day or so. It works like a charm every time and keeps our whites looking their best. If you are breastfeeding and you have a blowout, try this method and let me know how it works for ya! Preservation: I know, I know…the dryer does a good job at keeping our clothes nice and fluffy, but hear me out. All the stuff in your lint trap is your clothing breaking down! When I read this in Good Housekeeping a few years ago it sort of shocked me. Drying clothing and linens in the drier wears fibers down faster and can do a lot of damage by shrinking things you may have wanted to hold onto or wear at least a few more times. Although line dried fabrics won’t come out super soft, air-drying keeps your clothing much stronger for longer and helps your special pieces retain their quality. Humble Handwork: This reason just may be my favorite of the six, the humbleness and calm that comes from doing housework by hand. I feel within our doing culture, especially with regard to working mothers nowadays, there is a undercurrent of feeling rushed and anxious and busier than we really ought to be. Most mothers I talk with are tempted, if not compelled, to take shortcuts when it comes to homemaking just so they can fit everything in. I feel this pressure from time to time, and I think one of the reasons life seems to be getting busier by the second is because we keep putting more and more on our plates when we really should be saying no to the unessential and taking time to work with our hands. I don’t know about you, but I really enjoy stepping outdoors to listen to the birds as I do a simple act of service for our family. For me, line-drying laundry is just that as it’s something I do pretty much daily when the weather is nice. You most likely already know this, but I am in the camp that favors going out of my way to make the mundane more enjoyable if possible. I mean if you have to scrub the dishes why not do it with a delicious smelling soap and pretty wood scrub brush, right? Another ode to humble homemaking is that hanging clothes on the line while the kids run around the yard is very therapeutic for me. I love the respite it offers me in my sometimes hectic day watching three turkeys. I like that this task offers the kids and I the chance to step out into our beautiful garden at least once each day to play and tend to chores. I really appreciate that they get to see in action their mother doing something for them and for the family. And last but not least, I really love taking peeks out the window in our kitchen throughout the day and catching tiny onesies billowing in the breeze. The sight of a clothesline is very soothing to me. I am finding that I would much rather do a few things well than a bunch of things half-heartedly, and I have been applying that to different areas of my life, especially in the art of homemaking. I take delight in doing chores the way I know my mother and her mother did them. I connects me and roots me to my past in a way that makes me feel apart of something bigger and more important than just doing another load of dirty laundry. Being intentional with chores like this helps me remember my childhood and ignites my passion to create similar memories for our children. What about the fluff? I must say, a warm fluffy towel is pretty amazing. Sometimes I’ll throw the towels in the drier for ten minutes or so at the end of the drying process to help smooth everything out. That seems to do the trick if I am really wanting our linens super soft. Most times I skip this step. Shake everything out really well. Speaking from experience, you may want to give your clothing and linens a little shake shake shake before bringing them inside after they have been on the line all day. Just like anything else outdoors, little creatures can find their way into sleeves and up pant legs and no one wants a spider to make a home in their pocket. Keep in mind the areas on your line that have the most direct sun and put your whites there. Our line is in partial shade so I put the darker items I do not want to fade in that section with the whites over in the full sun. What about rainy weather? If it’s raining and you need to do laundry, get yourself a wooden accordion drying rack (these are portable and wonderful) and put it on your covered porch or patio. We have one from Home Goods and I like to take it to our screened in porch if I know it’s going to rain and I want to air dry something. Your clothing will dry in no time out there and smell just as if they dried on the line. Use Wool dryer balls in lieu of dryer sheets. I have these ones from Smart Sheep and they work really well. Stock your laundry pantry with plant based all-natural detergents like ones from The Laundress or Mrs. Meyers and steer clear of anything that looks like a dryer sheet. Put a few drops of essential oils on your wool dryer balls to make your laundry smell nice without the use of chemicals. Well that should do it! 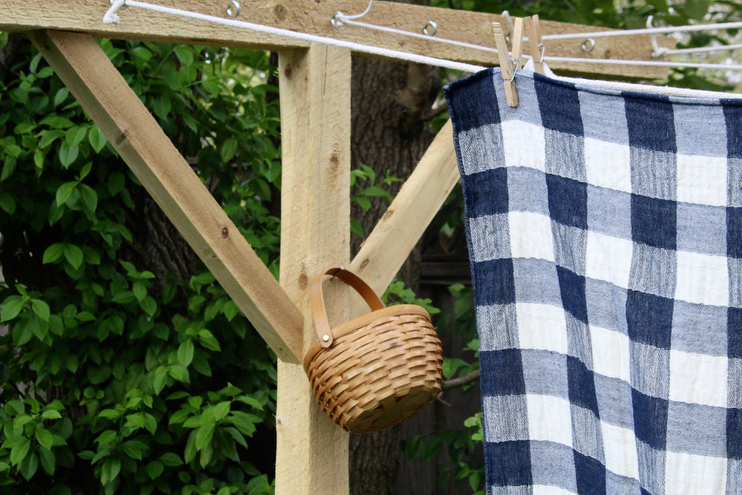 For those who have a clothesline, what is your favorite reason for using it? Any tips you have for me would be lovely! And as always, thank you for taking the time to read and share. Your kind words and encouragement are always a breath of fresh air. This is such a thoughtful and beautiful post. I unsuccessfully rigged up an outdoor line last summer so this will help me set things straight. Brandy – Absolutely! In short, the stuff in dryer sheets and fabric softener that make our clothes so soft are actually a combination of very toxic chemicals…we ditched these laundry goods after finding out that Theodore has eczema and it made a big difference on all our skin. Check out the list of ingredients on the back and you’ll be surprised…many are considered hazardous which is just horrible considering we tumble our clothes with them then wear them! As an Australian, the methods used by most North Americans to dry their clothes has always surprised me. Down here, line drying is the default and we all start whinging about having to use the dryer for emergencies after a week of rain! We have the amazing Hills Hoist (google it!!) that spins with the wind and holds a good few loads of washing. I also have a trolley for the washing baskets so that I can wheel it where I want it, and also I don’t have to bend down to pick up each item that needs to be hung. From that I hang a small clothes peg basket. The spring pegs work best in my experience. I agree with your reasons wholeheartedly! Unnecessary use of electricity (environmental and cost), the beautiful smell and brightness of wind and sun dried clothes, and the joy and peace of spending a few moments outside. Hi from Spain Amanda !! I love your home and your lifestyle. It really depends on the company – even beauty products by companies like Weleda contain fragrance, yet it is fragrance made out of essential oils, meeting high environmental standards like the rest of the ingredients. So to say this fragrance is as bad as the fragrance used in cheap drugstore products (which also contain many other toxic ingredients) would be kind of shortsighted, wouldn’t it? Great post – I’m from Europe and definitely not used to using a dryer. It just wouldn’t occur to me. Also, there’s another reason for air-drying: your clothes last much longer. Dryers are so hard on the fabric – I never ruined as many clothes as I did during the time when I lived in a dorm and didn’t have the opportunity to air-dry my stuff anywhere. I am a new reader, having discovered you through Pinterest. I love your blog and the topics you choose to write about. I’ve been having fun reading through your older posts! When my daughter was born, I was suddenly (like, overnight) inspired to start living in a slower, more intentional way, and one way was finding alternatives to home care. I had my husband rig up a clothesline on our townhome’s deck, and I was fairly giddy when I saw that first load of diapers drying in the breeze! So I get your delight in seeing those tiny bits of clothing swaying in the sunshine! I look forward now to reading your posts each week. Happy homemaking to you, and thank you for the inspiration! This post was such refreshment to read. I grew up in the country with a big old clothesline, but also with five siblings and a mama who cultivated the same attitude you have toward the humble beauty of the many constant, necessary, messy, sometimes tedious tasks of keeping home and family. Your reflections on the intention and restful pause of hanging laundry resonated with me, as did your reflection on busy-ness and shortcuts and the beauty of slowing down and finding the joy in our work – which is the work of nurturing, when it’s all boiled down. This post reminds me so much of my mommy and grandma. Up to these time clothes line are still very much use here in the Philippines, though there are many housewives using fully automatic washer but there are still many using literal handwash of clothes that are all together put in the clothes line to dry. Since we live in the province in my younger years and have space for all the clothes to be air dry, the space is not compromise back then. But now that i have a family of my own and in city living we tend to replace clothespins by hangers. We put the clothes in the hanger and let it air dry then we knot the rope in 1/2-1 inch so that the clothes will not too close to each other and still have a good air sunrise smell. I think this will be a tradition of so many housewives here and a memories for all the kids seeing their mamas doing the daily chores. A tradition that can’t be change of the new generation of modern technology. And only a proof that a good childhood memories brought a big impact to ones life. 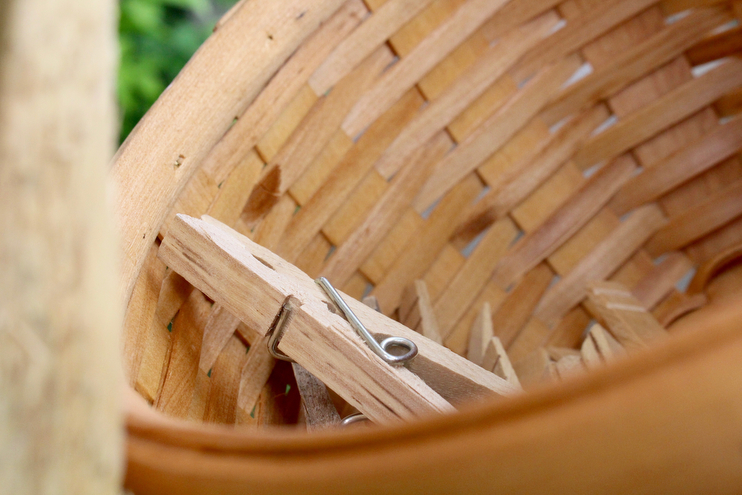 Do you have a good resource for sturdy clothespins? Dear Amanda, your posts here and on ig are truely wonderful and inspiring. The last few days I am feeling quite overwhelmed – everything is too much , even though my husband and children help with chores (they are already 15 and 11) I don´t have the energy to finish laundry etc. since I started working 30 hours a year ago (before it´s always just been 20hrs/week so I could be with my kids in the afternoon) it´s been difficult to adjust and find a routine where there is still enough time for family, household, friends and maybe even me. Reading this positive post about laundry makes me feel calmer and more serene already – simply beautiful. I have just discovered your lovely blog and look forward to following you. I am a mother to two grown daughters and Grammy to four grandchildren. Being a homemaker has always been a joyous and beautiful thing to me. I love the pictures of you with your precious babies bundled up to you. Your children are beautiful. Hanging laundry on a clothesline has always been one of the great delights of my life … Watching children running through sheets flapping in the breeze. I can still hear the echoes of their laughter. I used to tell my little girls that the fragrance on the line dried sheets was what God’s breath smelled like. Your post takes me back. Thank you and Bless you and your family. Lots of useful tips here.